After you’ve signed into your Amazon account, hover your mouse over where it says Your Account at the top right corner of the Amazon page. When the drop-down menu appears, click on Manage Your Content and Devices. In the line of tabs near the top, click Device. 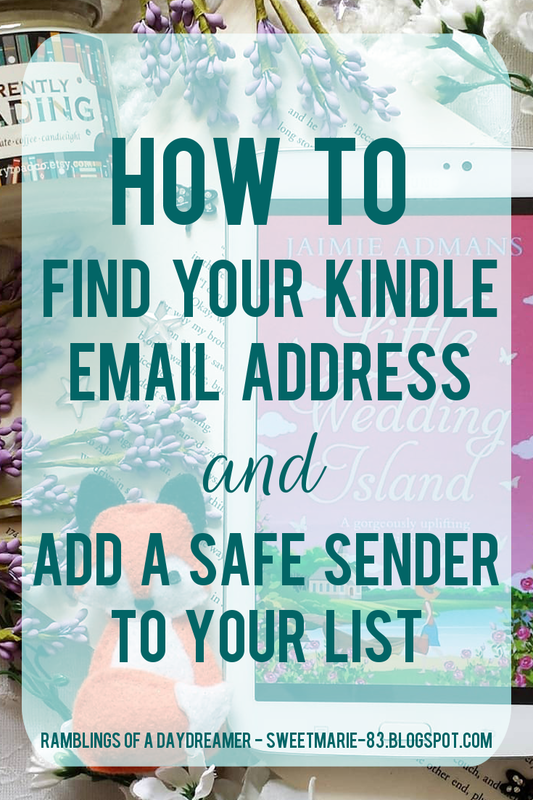 Your Kindle email address should be near the top. It will end in kindle.com Alternately, click on Preferences and scroll down to Personal Document Settings. 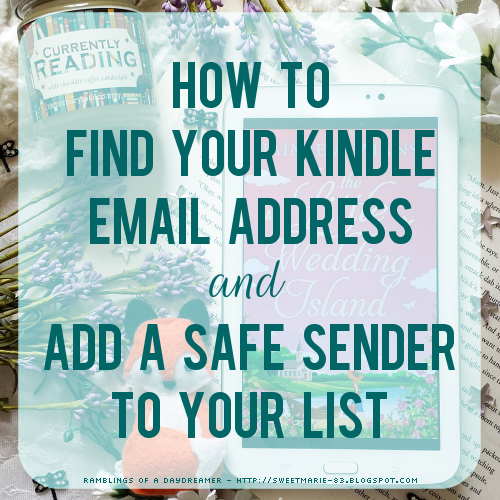 You’ll also find your Kindle email address here. There might be several; I have three - one for my actual Kindle Paperwhite, one for the Kindle app on my phone, and one for the Kindle app on my tablet. Each one has a distinct email address, but stick with your main Kindle address. Now, if you want to add a sender to your safe list, stay on that page and scroll down to where it says Approved Personal Document E-mail List. Click on Add a new approved email address and add the email you’ll be receiving a book from. For good measure, I’d also advise simply adding gmail.com and hotmail.com to the list; I did that after I entered a sender’s email once and still didn’t receive the ARC, then it came through. That’s it! I hope you found this helpful! If you did, I'd be grateful if you'd share on Pinterest, Twitter, and Facebook! This is THE BEST post. I have been struggling to do this for so long. I figured it out a while ago, but this is great for the readers who don't know yet! Thank you so much! It took me forever to figure it out initially and then I kept forgetting how to do it.